The S&P 500 suffered a 10.2% correction in early February before recovering to post a 0.8% loss in the first quarter of 2018. The fractional loss followed a 6.6% gain in the fourth quarter of 2017, 4.5% in the third quarter, 3.1% in the second quarter and 6.1% in the first quarter of 2017. Volatility reappeared after a two-year lull. 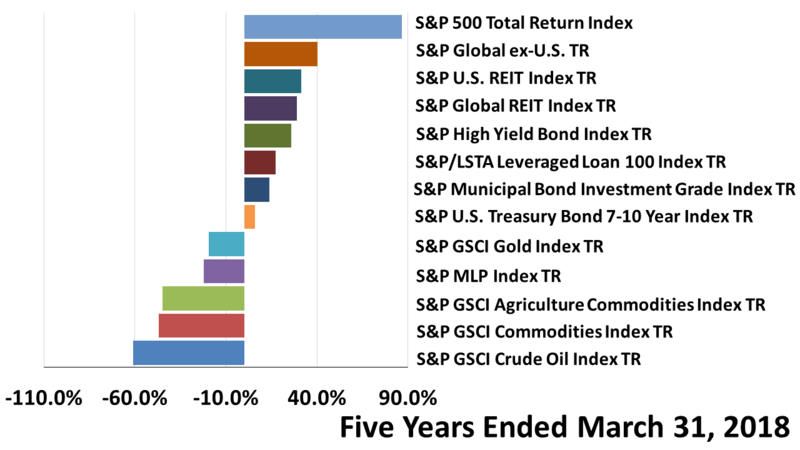 Over the 10 years shown, $1 invested in the S&P 500 grew to $2.48. From the low on March 9, 2009, $1 in stocks grew to $4.72 -- a 372% return! What makes America exceptional among all nations has been unfolding in plain sight for 10 years, but it is always difficult to recognize it the moment it is happening. The technology sector was again the standout in the 12 months ended March 31, 2018. 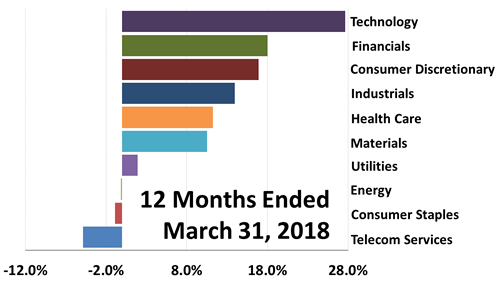 The laggards -- telecom, consumer staples, energy, and utilities -- are considered more defensive. This is a sign of a gradual shift in sentiment toward riskier assets. 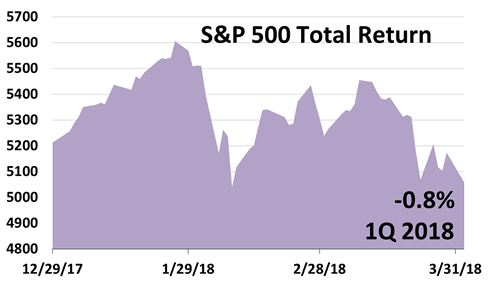 The S&P 500 index’s total return of 87% in the five years through March 31, 2018, was more than double the 40% return on the S&P global stock index excluding U.S. stocks. For the first time in years, global growth accompanied the long U.S. expansion, boosting returns of a portfolio broadly diversified across the globe. 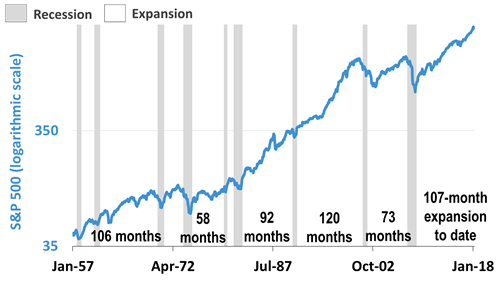 At 107-months old, this is the second-longest expansion in modern U.S. history, surpassing the 106-month long expansion of the 1960s, and just 13 months shy of the 120-month boom of the 1990s -- the longest ever. 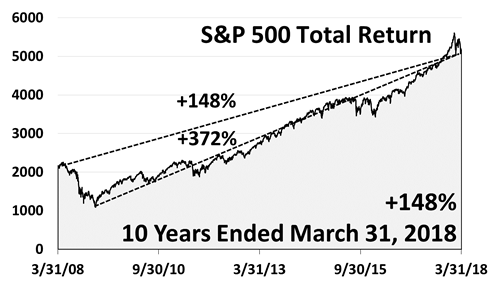 With fundamentals strong, this is likely to become the longest in post-War America. After hiking rates in March, the Fed said three more quarter-point hikes would follow in 2018. 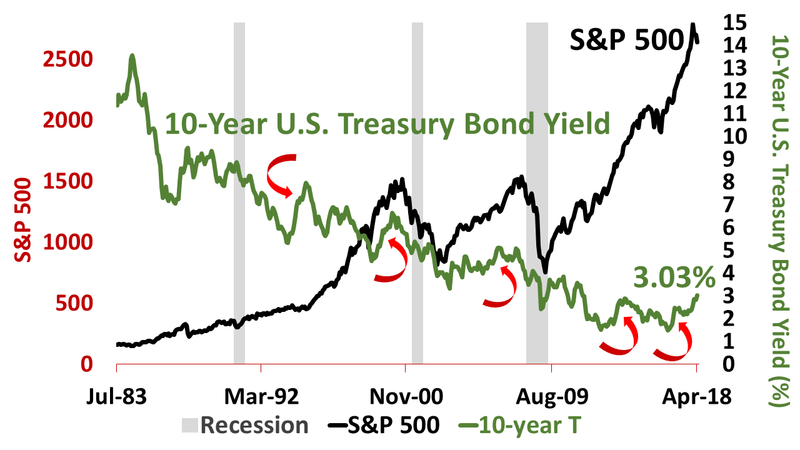 Interest rate cycles are slow. The most recent 24 years were marked by falling rates, while rates fell the previous 24 years. A new rising recently began. 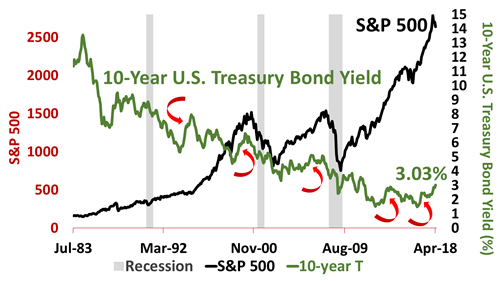 Rising bond yields often coincided with bull markets in stocks in the past. This article was written by a professional financial journalist for Heling Associates, Inc. and is not intended as legal or investment advice.